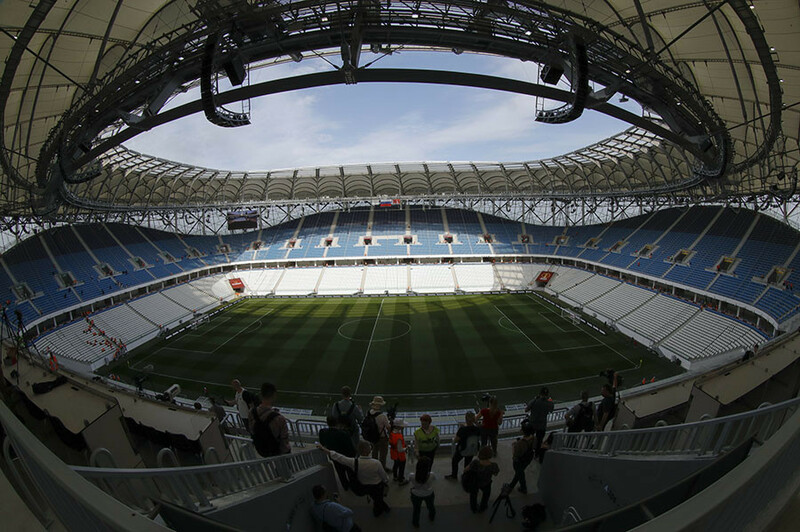 On June 18, Volgograd will host its first World Cup match between England and Tunisia. RT Sport paid a visit to the riverbank city to explore its history, quirks and construction ahead of Russia 2018. Scarred by war, Volgograd represents a patch of territory engrained in Russia's rich and storied history. Originally named Tsaritsyn, the city became Stalingrad in 1925 in honor of Joseph Stalin, to commemorate his vital role in the defense against the White Army between 1918 and 1925 during the Russian Civil War. During World War II, the city endured the bloodiest of all battles of the bloodiest of all conflicts: the Battle of Stalingrad from August 1942 to February 1943 in which 2 million people perished. This year, Volgograd celebrates 75 years since it ended. Still today, in the city's darkest corners – where broken buildings that housed guerilla warfare still stand to cast shadows over the snow – it is just that. They are reminders. Memorials. Not handsome, but harboring somber affection. Although the battle lasted only five months, Volgograd carries an air of remembrance against its bleak backdrop even three-quarters of a century on since the last Axis soldier surrendered. A city stained by the Battle of Stalingrad in World War II. The battle saw more losses than any blitz of any city, and more than the Siege of Leningrad, present day St. Petersburg, over 1,600km north. The city and its new stadium beneath the gaze of the breathtaking Motherland Calls (Rodina Mat), standing taller than New York's Statue of Liberty at 85 meters tall and weighing 8,000 tonnes and erected as a defiant reminder of past struggles for a free future. She oversees a new era for the city: Volgograd Arena, built on the banks of the Volga River which begets the city its name. The statue sits atop the Mamayev Kurgan memorial. The steps ascending the hill feature walls with messages of remembrance and reminders of the struggle for freedom. Daily memorial services are held at the Eternal Flame, which houses a wall with the names of all those who died in combat. The statue overlooks the new epicenter of Volgograd's legacy, embodied by Volgograd Arena – the city's World Cup stadium. 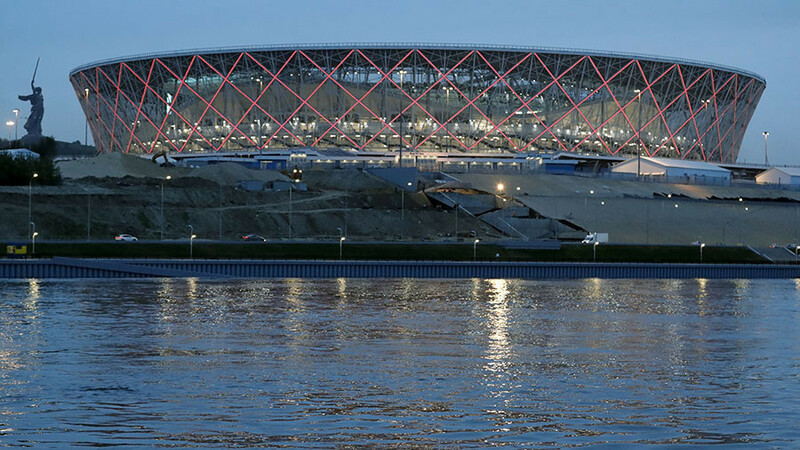 Built on the very banks of the Volga River, the 45,000-capacity Volgograd Arena was especially built for Russia 2018, on the site of the former Central Stadium (Tsentralnyi Stadion), now demolished. In a sobering reminder of Volgograd's pockmarked past, when ground was broken for the construction of the arena, 300 unexploded bombs and the remains of two soldiers were found on the site. In February, the site of the ground was a hive of activity, featuring a round-the-clock rota of construction work in an effort ensure it was ready to hold the 2018 Russian Cup Final on May 9. The match passed all requirements as FC Tosno beat Kursk Avangard 2-1, which secured them a place in European football for next season. Now the stadium will see eight teams battle it out for World Cup glory. Aside from The Three Lions of England taking on Tunisia's Eagles of Carthage in a repeat of their meeting at France 98, The Samurai Blue of Japan will meet Robert Lewandowski's Poland. Russia's Group A opponents Saudi Arabia and Egypt will face off against each other in a match featuring the whimsical talents of the Premier League's best player Mo Salah, and Nigeria's Super Eagles will also take on the Vikings from Iceland. Keeping hydrated in the sun is key to enjoying a football match and in Volgograd the possibilities of keeping well-refreshed are ample. One drinking establishment has introduced possibly the world's most controversial cocktail – named 'Novichok'. A chance get-together with English tourists proved a lightbulb moment for mixologist Denis Kamaev to tailor a cocktail for his guests, which he promptly named after the nerve agent said to have been used in the poisoning of former spy Sergei Skripal, in a cheeky dig at the souring political landscape between Russia and the UK. 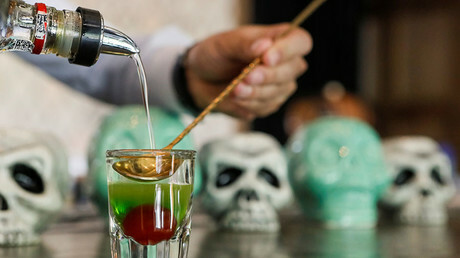 The light-hearted libation has been marketed as "For Fans of England from Volgograd with love", and Three Lions supporters will be able to sample the cocktail before their game with Tunisia on June 18 – if they dare. The town's local team is Rotor Volgograd, who will occupy the magnificent Volgograd Arena. The team endured a turbulent 2017/18 season, culminating in their relegation to the third tier Russian Professional Football League. Russia's third level, one rung above amateur football, is a far cry from Manchester United's iconic Old Trafford stadium, where Rotor recorded a famous victory against The Red Devils in the 1995/96 UEFA Cup. The banks of the River Irwell in Manchester is a fair trek from those of the River Volga, but that mammoth trip was made by United manager Alex Ferguson – then four years shy of a knighthood – and his Man United team 23 years ago. Traveling fans of a certain age still regale others with tales of being treated to shots of vodka from locals on their journey to the city's Central Stadium. The warm greetings preceded a tepid although not entirely uninspiring 0-0 draw, leaving all to play for in the return leg in England. Back on the banks of the Irwell in the second leg, United got off to a less than ideal start: Rotor strike duo Vladimir Niederhaus and Oleg Veretennikov netted for the visitors before the clock showed half an hour. A second-half goal from Paul Scholes pulled one back for United, to leave the English side needing another two to avoid crashing out on the away goals rule. With full time approaching, United won a corner. Sensing desperation, United goalkeeper Peter Schmeichel made his way into the away penalty box. He met the incoming cross to head in an 89th minute equalizer. The goal salvaged a draw and United's record of 56 European games in England without defeat, but couldn't save them from going out of the competition. Despite their early UEFA Cup exit, that season Manchester United went on to win a Premier League and FA Cup double in the 1995/96 season. The intervening years were not as kind to Rotor. Although the club was one of the strongest in Russia, finishing runners-up to Spartak Moscow for the league on two occasions, and playing five successive season in European competition in the mid-1990s, the club spiraled into decline at the turn of the century. In 2004, they finished bottom of the Russian Premier League (RPL) and one year later were stripped of their professional license entirely, despite the best efforts of owner and State Duma member Vladimir Goryunov. Shortly after the club's reserve and first teams were merged. When the Russian 2018 World Cup bid was announced, Volgograd became candidates for a new stadium, provided they had a professional club. The Russian government created and introduced FC Volgograd as a team, which then joined with Rotor in 2009. The new incarnation were then promoted to the second tier but only by virtue of teams above them withdrawing. A later 150 million ruble ($4.9 million) cash injection into the playing budget for the season could not stop the club from being relegated and then enduring a five-year stint in the Russian Amateur Football League, after which all government funding was withdrawn. At the end of the 2017/18 season, with roughly one month until the start of the World Cup, Rotor was relegated from the second tier Russian Football National League (FNL) on the final day of the season. Volgograd ambassador Larisa Ilchenko, the 2008 Olympic gold medal winner in the swimming Marathon (10km) event, says that the Russia 2018 World Cup will be the "first time elite level football has taken place in the town since Manchester United's visit" 23 years ago. Taking into account the tumultuous fortunes of Rotor Volgograd, it would be difficult to argue with Ilchenko on that one. After scoring the goal that kept Manchester United's European record alive, but agonizingly fell short of keeping them in the competition, Schmeichel went on to collect major honors between the sticks at United, culminating in winning an unprecedented treble in the 1998/99 season, at the end of which he bowed out and moved abroad to Sporting Lisbon. 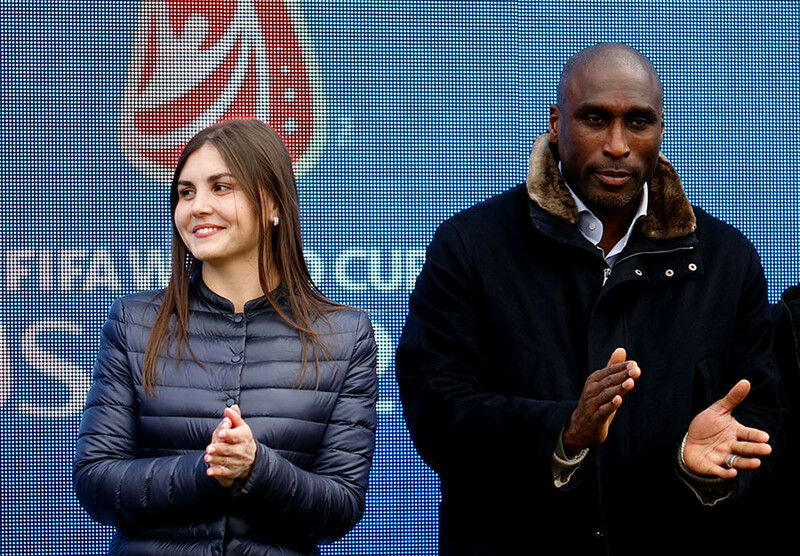 Schmeichel returned to Volgograd during a World Cup year to cast an eye over the city as it readies itself for Russia 2018. Nicknamed 'The Great Dane' during his playing career, former star stopper Schmeichel took a boat trip to view the city from the famous Volga waves. The five-time English Premier League winner tried his hand at switching sporting codes to become a goalie for local hockey club 'Tsaritsyn'. Despite his Premier League prowess as a football goalkeeper, Schmeichel was stumped and, after just about finding his balance, the keeper shipped his fair share of goals and had to be helped from the ice to lick his wounds in the dressing room. On June 18, one of Russia's most historic cities will open the door to a new chapter during the Russia 2018 World Cup, when Volgograd will again receive a small chunk of the world's attention for a few short weeks, but for reasons far detached from those that made it the center of a world war three-quarters of a century ago.